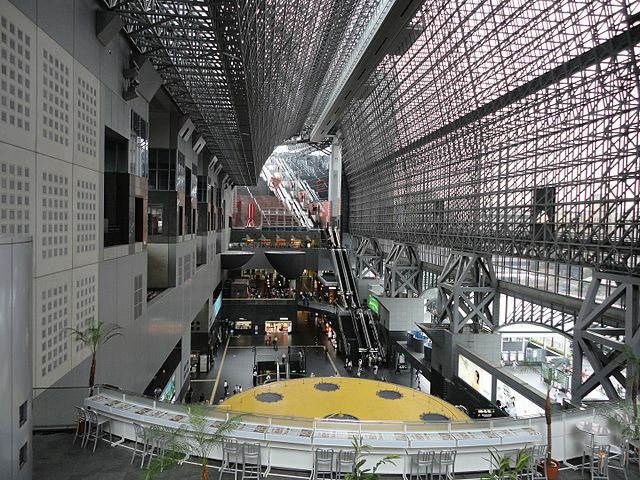 The current Kyoto Station opened in 1997, commemorating Kyoto's 1,200th anniversary of the capital's foundation in Kyoto. ​With 70 meters high and 470 meters from east to west, it has Japan's second-largest station building after Nagoya Station. 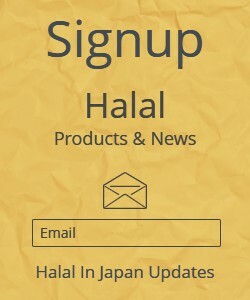 It houses a Hotel, a Movie Theater, several Local Government Facilities, Isetan Department Store and the Cube which is a collection of excellent Restaurants. The building is extending to Porta an underground Shopping Mall which is located under the bus terminal. Ramen lovers can find Ramen Koji on the 10th floor that offers eight regional styles of ramen restaurants under one roof. ​Even if you are not travelling by train, it is worth spending an hour or so wandering around the station, which is an outstanding example of modern architecture. Take the main escalator or 171 steps of the stairs to the top where there is a "Rooftop Garden" with views over the city. 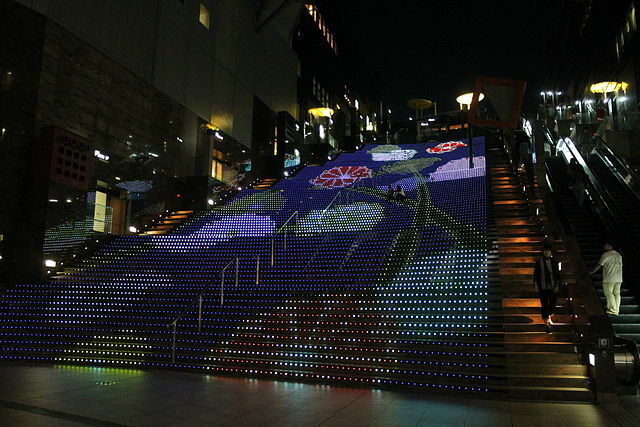 At night time the stair case has a "Light Show" with corresponding music. ​​If you have a head for heights, walk across the Skyway, a tunnel with glass windows that allows visitors to walk the length of the station, 45 meters above the central hall. 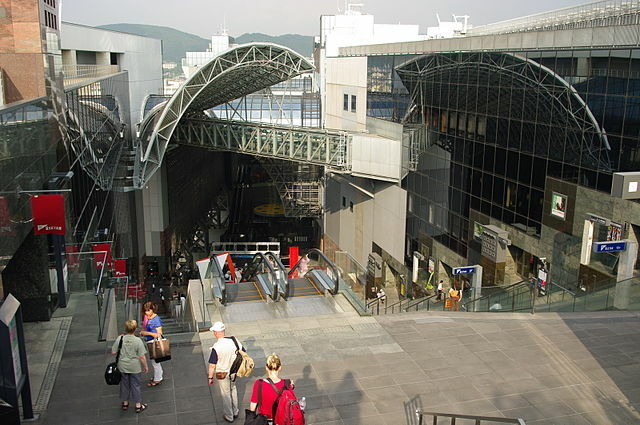 Kyoto Station, the city's transportation hub is a major stop on the Tokaido Shinkansen Line. ​Central Kyoto is served by two intersecting subway lines; the north-south Karasuma Line, which stops at Kyoto Station and the west-east Tozai Line link up at Karasuma-Oike Station near the city canter. 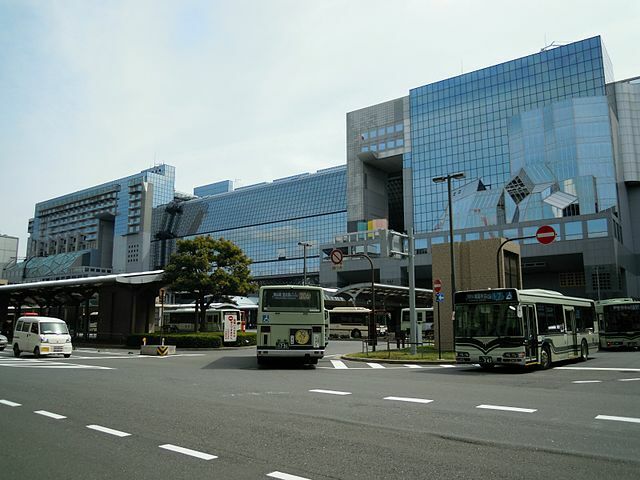 Several important bus routes, covering not only Central Kyoto but other parts of the city as well start and end at the Kyoto Station. The bus terminal is right in front of the Station. Take the station's Karasuma/North Exit and you'll see the bus terminal, which is divided into four boarding platforms From A to D, and has signs in English identifying key stops on each route. 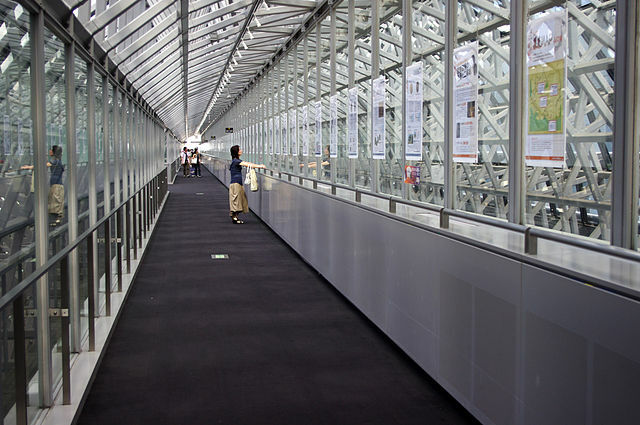 For detailed route information, pick up a copy of the helpful Bus Navi leaflet from the Tourists Information Center on the second floor. If you plan on taking the bus 3 times or more in 1 day, with Kyoto City Bus & Kyoto Bus One-Day Pass you can take as many times as you want for a flat rate which covers major tourist locations with the exception of few that are outside the applicable zone.